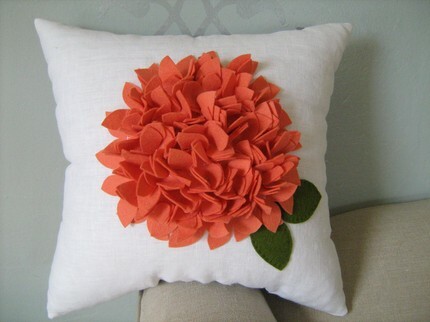 To continue with our 'orange flowers' theme today, we are giving away this adorable, handmade orange hydrangea pillow to a lucky Clemson Girl reader! The pillow is made from white linen with 100% wool felt. This would add a great punch of color to your couch, chair, or bed... OR it could easily be used as a ring pillow for a wedding (just sew on a ribbon in the center). It measures 14" x 14" and comes stuffed in clump free cluster stuffing. This pillow sells for $56. To enter the giveaway, all you need to do is comment on this post with your first name and last (or just your last initial) and then answer the question "What color or colors would you pair with orange for a wedding?" **Mention if you're a Clemson Girl official blog follower (see followers in right column) and you'll get an extra entry! The time to enter is now...You have until noon on Friday, May 28th to enter. We will randomly draw from the list of entries and announce the winner on the blog Friday afternoon. Ellen T. I'd use a lavender with orange! Definitely white...although a fushcia would be a nice variation of purple to use in the summer! I'm an official follower..Melissa S.
Mandie McGrath! I would have to use a bright but elegant yellow! Angie P...Ive always wanted a fall wedding so I would pair orange with brown and white with a splash of purple just to be true to my Clemson spirit! Kerri K. I've seen orange flowers paired with red (think cabernet) dresses, and the result was stunning. However, being a Clemson girl...I'd work a little purple into the mix! PURPLE! A brown or blue might be pretty, too though! I image a spring/summer wedding. So I would pair orange with bright blue and add hints of purple! Amanda T.
i'd use a light olive green with orange!! Haley Hamam. Since it's summer, I would try a lemon yellow color and add a bright purple. I would use a sapphire blue! I'm getting married in July and we are using Clemson colors! My bridesmaids are wearing orange, and of course we are using purple as an accent color, with ivory. Not only do I love the colors because I love Clemson, but they look so amazing together! I cant wait to see everything together on the big day! Lauren F. I'd throw in a few purple accents to the decor and have the guys wear khaki suits with orange ties/bow ties instead of tuxes so it look more like southern prep than halloween =) LOVE that pillow! Well it depends on if you are staying true to your colors or not really a Clemson Fan. Me on the other hand because I am a Clemson Fan would have the bridesmaid dresses Clemson orange, with white sashes and purple boquets.Wedding dress would be of course Whites with orange sash and purple boquet also. Men would have white suites with orange vests purple ties. Groom also!! I would use orange and a light, sky/almost Tiffany blue combo. Wow, would be a gorgeous wedding! Cody G. If it were a Clemson wedding I would have no choice but to use orange, white, and purple! I think an all orange wedding, different shades, would make a beautiful Clemson wedding. of course, white and purple accent. Purple and white of course! Ruth H. I'd use white in the summer and brown in the fall. But, seriously, who would plan a wedding during football season?! Chana B. If I wanted a traditional Clemson Wedding, I would only use white, but I would include a POP of purple flowers in the bouquets. A metallic (the new neutral) would be lovely and not clash or take away from the orange. My daughter used various shades of orange, along with celadon green, and it was beautiful. I love reading the blog! Linda Towery. I would use white\ivory or purple! Lindsey S. I would pair it with lavendar, chocolate, or grey/silver depending on the season. Rachel W, I'm a follower, I'd pair with pink! I loved, as you saw in my wedding photos, orange and brown! Love your blog!! Ashley H. When my husband and I got married we did Orange, purple and white. We did up the whole Clemson theme! I would pair it with a Fuschia and Lemon! :o) Beautiful bright + tropical! My name is Jenni T.